NETWORK FINALS: THE VOICE gained 0.1 in final numbers, but the JANE THE VIRGIN season finale lost the same. CABLE HIGHLIGHTS: ESPN’s NBA PLAYOFFS game led Monday cable at 2.05, while NBC Sports Net’s NHL PLAYOFFS game was at 0.55. On VH1, LOVE & HIP-HOP gained 0.08 to 1.26, BASKETBALL WIVES ticked up to 0.93, and TI & TINY was up 0.02 to 0.78. USA’s WWE telecast was at 0.97/0.89/0.87, compared to last week’s 1.02/0.96/0.94. On Discovery, STREET OUTLAWS rose 0.08 to 0.97, and VEGAS RAT RODS was up 0.07 to 0.49. AMC’s BETTER CALL SAUL climbed 0.04 to 0.67. On MTV, TEEN MOM dropped 0.04 to 0.56, but the AFTER-SHOW was up 0.08 to 0.40. Adult Swim’s midnight NEON JOE was at 0.42. On Bravo, SOUTHERN CHARM fell 0.09 to 0.39, and SOUTHERN CHARM SAVANNAH was down 0.07 to 0.19. 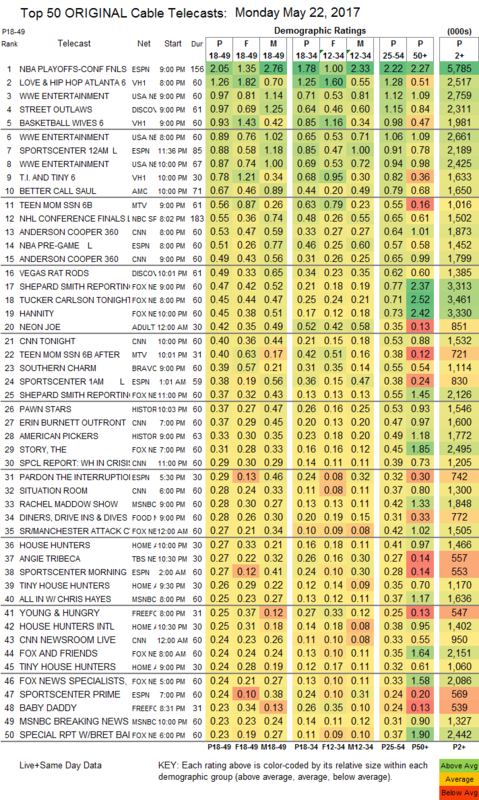 History’s PAWN STARS was at 0.37, up from last week’s 0.31/0.26, and AMERICAN PICKERS gained 0.08 to 0.33. Food Network’s DINERS, DRIVE-INS & DIVES was at 0.28, and KIDS BBQ CHAMPIONSHIP held at 0.19. On HGTV, HOUSE HUNTERS grew by 0.02 to 0.29, TINY HOUSE HUNTERS was at 0.26/0.24 compared to last week’s 0.27, and HOUSE HUNTERS INTL was down 0.05 to 0.25. 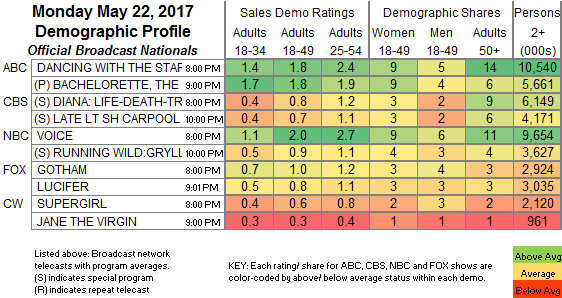 TBS’s ANGIE TRIBECA gained a tick to 0.27. On Freeform, YOUNG & HUNGRY climbed 0.06 to 0.25, and BABY DADDY was up 0.01 to 0.23.